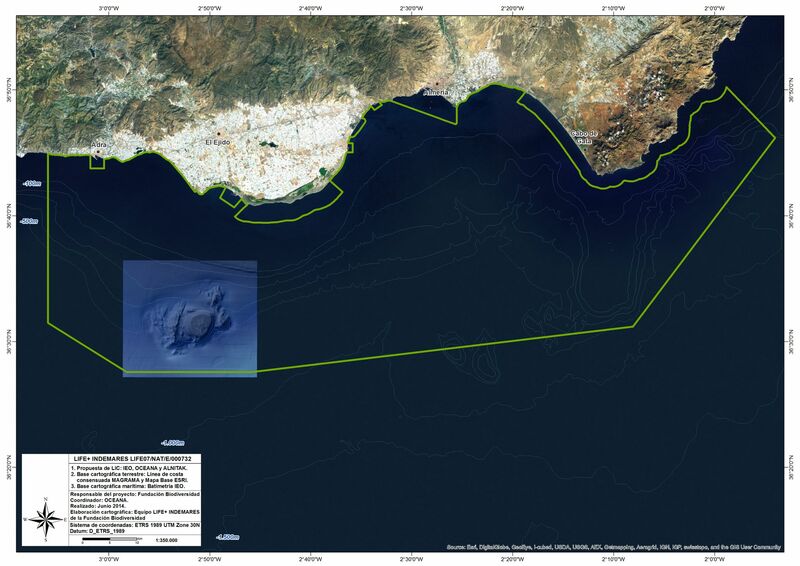 Southern Almería - Chella bank is a marine area with 2,829 square kilometers, located in the south of the Iberian peninsula, and characterized by high productivity of its waters and a great diversity of marine species and habitats. Shallow coastal areas, deep sea, mountains and canyons are part of the seabed, providing such a variety of environments that allow the settlement of a variety of organisms. The Seco de los Olivos or Chella bank is a seamount, volcanic in origin, where more than 600 species have been found, 45 of which are protected and/or threatened, demonstrating the need to conserve this zone. Submarine prairies dominated by the seagrass Posidonia oceanica, characteristic of the Mediterranean infracoastal zone, up to depths of 40 m. The ecological importance of this habitat is unquestionable: besides protecting the coastline from erosion, these ecosystems provide food, refuge and a breeding ground for numerous marine species. Posidonia beds are an indicator of a good environmental state, as this habitat is very sensitive to disturbance and is only found in clean, clear waters. The majority of the shallow sea floor off the Almería coastline is covered by seagrass prairies. The most abundant species is Posidonia oceanica, although Cymodocea nodosa and Zostera marina are also present. Reefs are hard, compact substrates on smooth, solid bases that rise from the sea floor. They can shelter benthic communities of animals and seaweeds, as well as coralligenous concretions. Within the Seco de los Olivos habitat we find deep coral reefs dominated by Lophelia pertusa and Madrepora oculata, gardens of gorgonian sea fans and extensive fields of glass sponges (Asconema setubalense). It is necessary to highlight the discovery of carnivorous sponges, previously unknown in Spanish waters. Cosmopolitan species typical in tropical and temperate regions, although it may also be found in relatively cold waters. It is characterised by being very gregarious. Its very varied diet includes hake, sea bream, mackerel, octopus, squid, and prawns, among other marine animals. The Alborán Sea supports a population of about 1,200 dolphins. This is particularly important for maintaining a flow of genetic material between the Atlantic Ocean and the Mediterranean Sea. Cosmopolitan species found in tropical and subtropical waters. Solitary and omnivorous, its diet includes crustaceans, fish, molluscs, seagrass and jellyfish. 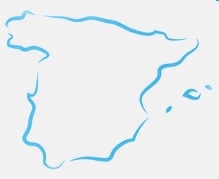 The Alborán Sea is an important area for this species, as it is a natural step in the migration route between the Atlantic Ocean and Mediterranean Sea, and constitutes an important feeding zone for juveniles and sub-adults, the majority of which originate from Atlantic populations.